You are here: Home / All posts / Savings, services and silver bullets – is integration all it’s cracked up to be? Manchester will have its work cut out plugging the funding gap in the current economic climate and greater integration of health and social care, while essential, may not deliver savings or reduced hospital admissions, argues Frances O’Grady. With the Cities and Local Government Devolution Act receiving royal assent at the beginning of the year, we may be a very big step closer to a new kind of architecture for local government and public services in many parts of the country. With devolution deals working their way through the Treasury pipeline and local political tensions yet to be fully resolved, we are facing a paradoxical situation where things seem to be moving very quickly and yet very slowly at the same time. In Greater Manchester, of course, it is full steam ahead, with Mayoral elections set for May 2017 and the Combined Authority taking direct control over a health and social care budget of £6 billion in April. For trade unions devolution poses a number of risks and challenges but some real opportunities too. So what does this mean for unions and how do we intend to respond? Greater Manchester is a good place to start. But first let us consider the bigger picture. The new devolution proposals for the English regions are a priority issue for the TUC, indeed ‘making devolution work’ has become one of the five key themes of our campaign plan this year. Our members know from bitter experience that the highly centralised political economy of the UK has left too many parts of the country behind. In fact, recent reports suggest that regional economic imbalances are growing. The TUC has long been a champion for a more dynamic approach to regional development – enhancing democracy and accountability through bringing decision-making closer to communities, designing and delivering public services more responsive to local needs, harnessing the voice of public service workers and the people they serve and stimulating economic growth through local control over infrastructure and an active industrial strategy. Yet the Osborne model being driven through the new Act poses real concerns. The ‘northern powerhouse’ rhetoric clashes with the reality of massive cuts to public services, reform to local government funding that may exacerbate regional inequalities, disproportionate public sector job losses and a government washing its hands of strategic industries like steel. The devolution deals agreed seem light on both resources and democracy, characterised by backroom deals between council leaders and Treasury officials with few stopping to ask what local people want out of it, while imposing directly-elected Mayors on communities that had previously rejected the model. Few of the deals so far have used the new powers to restructure public services and authorities have displayed understandable caution given the financial constraints they face. But we can assume bolder approaches will be taken in future. Public service unions are wrestling with the implications for the workforce, employment standards and collective bargaining. What will it mean for jobs? What will it mean for national agreements and will we see new attempts to push through regional pay? And how will we achieve closer integration of workers on very different sets of pay and conditions? Nowhere is this more pressing than in health and social care. Which brings us back to Greater Manchester. Health and social care integration remains the most eyecatching and problematic component of Manchester’s deal. Achieving a coherent and deliverable plan that brings together two very different public services across a complex and fragmented commissioning and provider landscape is an enormous challenge. Not to mention the ambitious aim of achieving financial sustainability with a £2bn funding gap to plug. Then there is the existential question about how to maintain the ‘National’ in a devolved NHS. Much of this will remain unresolved. Some of it necessarily. The TUC welcomed safeguards in the legislation that protect national standards and regulation in health but this will complicate lines of accountability in a devolved setting. Likewise, we will be adamant in our defence of national collective bargaining. Health unions successfully saw off previous attempts to break away from Agenda for Change by the South West cartel and will be vigilant against moves towards regional pay that emerge from any devolution deals. With the potential for significant changes to service provision, it is crucial that unions have a voice in this process. We have worked hard with the leaders in Greater Manchester to agree structures to build dialogue and partnership with unions across the public sector. The Joint Protocol signed by the leaders of GMCA and the North West TUC establishes a Workforce Engagement Board bringing unions together with leaders to discuss and manage the changes arising from redesign and integration. We are under no illusions that change will be easy but this approach may help build the kind of robust relationships that will help mitigate some of the worst impacts. There is much to admire in the GMCA Plan. Bringing services and providers closer together will help address some of the dysfunction and fragmentation across health and social care. Arguably, the plans represent a positive move away from the chaotic dislocation of the government’s 2012 reforms – with the 37 different participant organisations in Greater Manchester talking more of co-ordination and collaboration and less about competition. But all of this is over-shadowed by the financial straight jacket imposed by the Treasury and the government’s obsession with arbitrary budgetary surplus targets and their on-going failure to seriously address the funding crisis in the NHS and our social care system – both absent from the Chancellor’s budget statement in March. The much vaunted up-front funding given to the NHS in the Spending Review is already looking meagre, much of it disappearing into bailing out astronomical provider deficits and increased employer NICs payments. Elsewhere the budget for public health has been slashed, just the kind of investment into preventative measures that are integral to the success of the Manchester plan. The 2 per cent precept allowed to councils to raise money for social care will raise barely a third of the £6bn funding gap identified by the Health Foundation. The government may be dismayed to hear calls for more funding so soon after delivering what the Chancellor described as the “biggest ever commitment to the NHS since its creation”. But this is a crisis of their own making. After all, contrary to George Osborne’s claims of largesse, average yearly increases in NHS spending amount to around 0.9 per cent across this spending review period, compared to an historical average of 3.7 per cent. Government spending as a proportion of GDP is falling. Manchester will have its work cut out plugging the gap in this fiscal climate. Many agree the long-term solution lies in funding increases linked to productivity gains delivered through new ways of working, focusing on prevention and integration. But we should caution against glib assumptions that greater integration and prevention, with increased care in primary and community settings, will inevitably lead to significant savings, even though it might be the right thing to do for patients. Few people have faith in the NHS finding the £22bn savings targeted in the Five Year Forward View and research shows that, while patient care improves, there is no evidence to support assumptions that integration between health and social care leads to significant cashable savings or reduced hospital admissions. 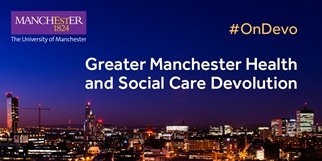 So while integration remains an essential, albeit often elusive, aspiration for improved health and care services, it may prove to be far from the silver bullet that many in NHS England, the Treasury or indeed Greater Manchester are hoping it is. In the run up to 1 April, when Greater Manchester is handed control of its £6bn health and social care budget, we are running a series of blogs from leading commentators on what it really means for the region. Read more on Devolution issues. Frances has been an active trade unionist and campaigner all her working life. She has been employed in a number of jobs from retail to the voluntary sector before working for the Transport and General Workers Union. Appointed as Campaigns Officer for the TUC in 1994, she became General Secretary in January 2013, the first woman in history to hold the post. Fair pay remains a core ambition – she was on the Resolution Foundation's Commission on Living Standards, and has been a member of the Low Pay and the High Pay Commissions. Frances was born in Oxford, has two adult children and lives in North London.